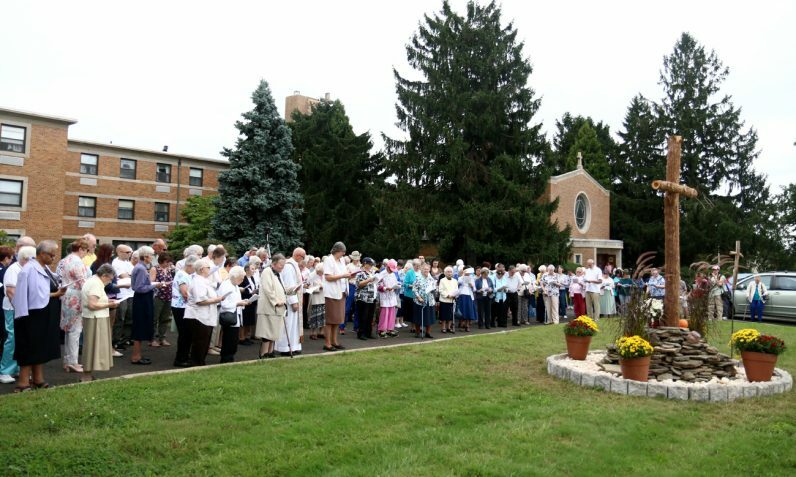 On Sunday, Sept. 16 the Missionary Servants of the Most Blessed Trinity (MSBT) in the Philadelphia Archdiocese celebrated the centennial of their congregation with the blessing of a new mission cross by Bishop Edward Deliman on the grounds of their Motherhouse and Cenacle on Solly Avenue in Northeast Philadelphia. It is no accident that their motherhouse is located next to Father Judge High School. The school is named for Vincentian Father Timothy Judge who founded the MSBTs — or Trinitarians — in Alabama in 1918 with the first general custodian or superior Margaret Louise Keasey — in religious life, Mother Mary Boniface. She is now recognized as a co-founder of the congregation. The order was invited to Philadelphia by Cardinal Dennis Dougherty in 1920, and in 1925 after their Alabama motherhouse was destroyed by fire he further invited them to establish a new headquarters in Philadelphia, which they did in 1931. It was first on Wynnefield Avenue and eventually relocated to Solly Avenue. Cardinal Dougherty also put them in charge of the Catholic Children’s Bureau, which in that era oversaw the care of thousands of Catholic children who were in foster homes and Catholic institutions. Other notable works of the young congregation were among Italian immigrants in South Philadelphia and at Holy Redeemer Chinese Catholic School. But from the very beginning their charism had a chief focus on social outreach, especially in the poorest sections of the city and in the prisons. Also from the beginning, the focus of the sisters was mainly on the spiritual and physical welfare and preservation of the faith of the poor and immigrants, and it remains so to this day. The cross that Bishop Deliman blessed is by no means the polished wood or metal or stone that one might see in churches and other religious settings. It is simply a rugged pole with a crossbeam nailed to it. That almost certainly describes the rustic cross that Jesus carried and died upon. 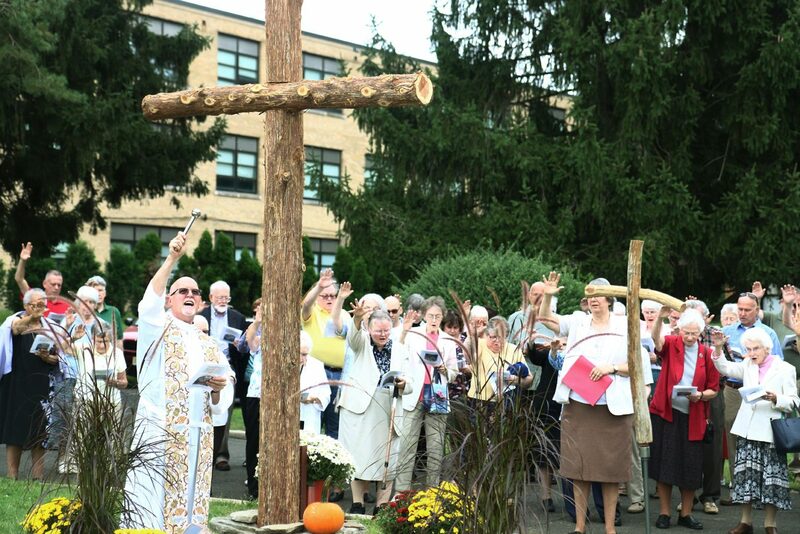 Mission crosses are an MSBT tradition, as the sisters try to emulate Jesus in their own faith journey. Sister Barbara McIntyre, who was recently elected to a five-year term as general custodian, is like Father Judge, originally from Massachusetts. When she was considering entering religion and deciding upon a congregation, a former boyfriend suggested the MSBTs, who had taught him in kindergarten and he really liked them. “I went and visited a couple of times and I was hooked,” she said. Now she has been a member for 40 years. Over the years things have changed in some ways, for example vocations are not as plentiful for the Missionary Cenacle Apostolate as in the past. In the beginning the dedicated women Father Judge enlisted to do God’s work among the poor and the immigrants were laywomen. After a time some discerned a religious vocation. But not all who wished to serve felt the calling to vowed religious life and from this number, a companion lay group was formed. This lay Missionary Cenacle Apostolate had Dr. Margaret Healy as its first general custodian. The encouragement of lay participation with the order has continued down to this day. As a matter of fact there is a small group of young lay women living on the motherhouse campus, among them Courtney McHale, whose day job is director of ministry at St. Hubert High School. “We came here because of the beautiful work the sisters do and to learn more about the work,” she said. Working with the poor is worldbuilding.